During the revolution of 1918/19 the economically significant princely estates owned by the dynasties that ruled until 1918 were confiscated but not expropriated by the new government. 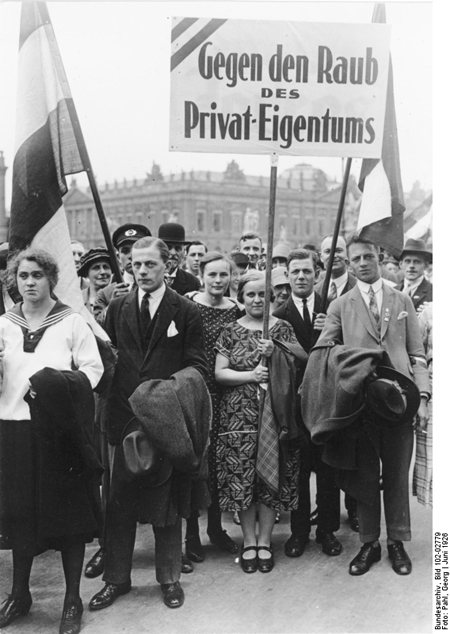 While the Weimar Constitution, which was ratified in 1919, guaranteed private property, it also allowed for the possibility for expropriations “for the benefit of the public.” The nobility now demanded the return of their confiscated properties as well as compensation for lost income. While the population still suffered the consequences of war and inflation, several courts decided in favor of the noble families, which caused outrage among large segments of the public. The KPD demanded the expropriation of the princely estates to relieve poverty among the general population, a demand that was supported by the SPD. A draft law to that effect was rejected by the Reichstag, however, and the KPD and the SPD subsequently tried to effect an expropriation without compensation by plebiscite. But when the plebiscite occurred on June 20, 1926, only 36% instead of the required 50% of voters backed the demand for expropriation. Instead, most state governments subsequently signed individual compensation agreements with the princely dynasties. This photograph shows participants in a mass rally organized by the DNVP against the proposed expropriation. The rally was held at Berlin’s Lustgarten. The City Palace, the Berlin residence of the Hohenzollern dynasty, is visible in the background. The protestor's sign reads "Against the robbery of private property." In addition to the DNVP, the DVP, both Christian churches, and Reich President Paul von Hindenburg were among the opponents of expropriations.